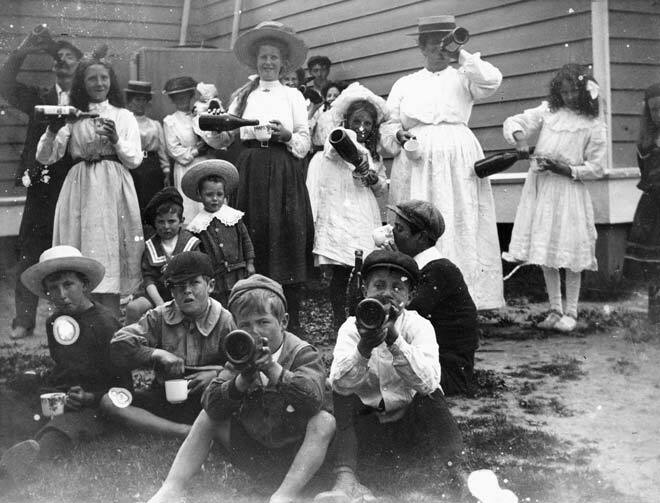 Despite appearances, these children and mothers in the goldmining community of Macetown, near Arrowtown, are almost certainly not drinking beer. It is likely they are drinking ginger beer or some other non alcoholic cordial which has been bottled in re-used beer bottles. Many male miners were likely to have indulged heavily in drinking, hence the availability of beer bottles, but many women made strenuous efforts to retain civilised traditions. This is probably a community event or celebration, as these residents seem to be dressed in their finery.